Instructions for a reborn or baby girl's matinee set in DK yarn. The set comprises of a matinee jacket, trousers, bonnet and shoes. They all feature a lacy diamond pattern embellished with a single ribbon rose. 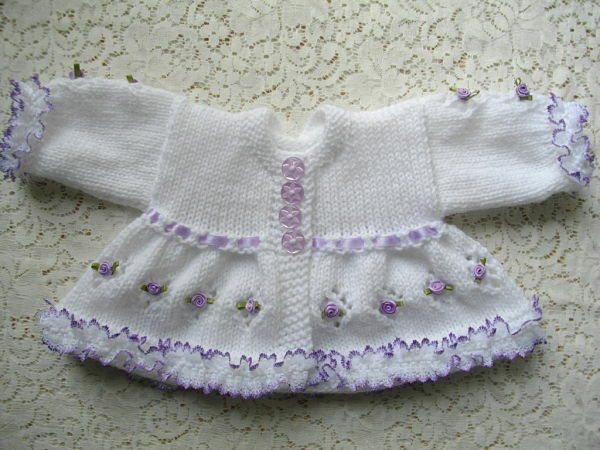 When knitted, the set will fit a premature baby 3-4lb or a 16 inch reborn doll. 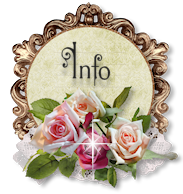 You will need 200g double knitting yarn, 3.25mm needles, 4mm needles, stitch holders, 5 metres knitting in lace, 2 metres of narrow ribbon, 37 ribbon roses, 1 triple ribbon rose, 2 small buttons for shoes, and 4 larger buttons for the jacket. This pattern has been designed by myself so it is in UK terminology. It does not follow the usual ‘shop bought’ format. There are 9 printed pages with clear and easy to follow instructions. All my patterns are tested by independent knitters before they are released, so every effort is made so that they come to you error free.